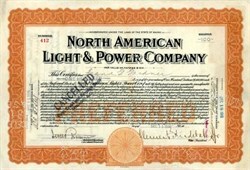 Beautifully engraved certificate from the North American Light and Power Company issued in 1916. This historic document was printed by the American Banknote Company and has an ornate border around it. This item is hand signed by the Company’s President (Clement Studebaker, jr.) and Treasurer and is over 86 years old. Clement Studebaker, Jr. 1871-1932; Clement and Ann Milburn Harper; Alice Rhawn (1893), Clement III (1894), Esther (1898). President and Chairman of the Board of the Illinois Power and Light Company (and of its subsidiary, the Illinois Traction Co.,) the South Bend Watch Co., and the North American Light and Power Co. Vice President of the Everett-Metzger-Flanders Co. (E-M-F). Treasurer of the Chicago and South Bend Railroad. The H & C Studebaker blacksmith shop opened in 1852 at the corner of Michigan and Jefferson Streets in what is now the heart of downtown South Bend, Indiana. Henry and Clement Studebaker's blacksmith shop would turn into the Studebaker Manufacturing Company in 1868, and would eventually become the largest wagon manufacturer in the world. Studebaker would also be the only manufacturer to successfully switch from horse-drawn to gasoline powered vehicles. The Studebaker Brothers. Clem, Henry, J.M. Peter and Jacob John Mohler Studebaker returned from California in 1858 where he made wheelbarrows for gold miners, and invested his earnings in the business. At this time, the brothers were filling wagon orders for the U.S. Army, and would continue to do so throughout the Civil War. By 1887, sales would eclipse two million dollars, and by 1885, production would top 75,000. Studebaker eased their way into the automobile market after the turn of the century, introducing an electric car in 1902. Gasoline-powered Studebakers came in 1904, produced by the Garford Company in Ohio, marketed under the name Studebaker-Garford. In 1911, Studebaker would join forces with Everitt-Metzker-Flanders Company of Detroit to form the Studebaker Corporation. Studebaker sold automobiles under the EMF and Flanders names until 1913; from thereafter, all new cars carried the Studebaker name. Studebaker was still producing wagons, and would do so until 1920, at which time automobile production was moved from Detroit to South Bend. Due to a number of factors, Studebaker's finances were poor by 1954, leading to a merger with Packard. Studebaker-Packard would fare no better, as Studebaker would lose 43 million dollars in 1956, and Packard disappeared altogether after 1958. Studebaker's financial problems continued. In December 1963, Studebaker closed its South Bend plant. Production continued through March 1966 at the Hamilton, Ontario, Canada plant, where a blue and white 1966 Cruiser marked the end of 114 years of Studebaker vehicle production.